The 8th Annual Los Angeles Greek Film Festival (LAGFF) had its Closing Night Gala on Sunday, June 8, with the annual Orpheus Awards Ceremony and Gala Reception at the Egyptian Theatre in Hollywood, CA. Following the screening of Yorgos Tsemberopoulos’ award-winning The Enemy Within, the closing night awards ceremony began. Festival Co-Founder Ersi Danou and Director Aris Katopodis took the stage to announce that this year has been the most successful in the history of the festival with a record 23 filmmakers attending the 5 days of films, forums and fun. 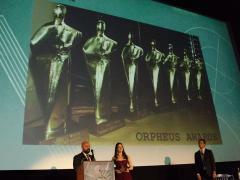 The Best Feature Orpheus Award went to the multi awarded Miss Violence by Alexandros Avranas, while Crossed Lives by Spyros Teskos won both the Best Documentary Orpheus Award and the Audience Choice Orpheus Award. Asimina Proedrou with her latest short film Red Hulk was the winner of the Best Short Film Orpheus Award and Elina Psykou, the director of The Eternal Return Of Antonis Paraskevas, won the Special Jury Orpheus Award. Last but not least, the Special Jury Mention went to the short movie Travel Express by Natassa Xydi. The awards were followed by a dinner reception in the Egyptian Courtyard with performances by Boston’s The Tripping Souls. You can take a look on the full list of the movies participating in the festival here.